Here's what you can expect working with us to look like. Our consultants tailor the engagement to YOUR unique needs and goals. Our goal is to come in, get results, and then leave in the shortest time possible. 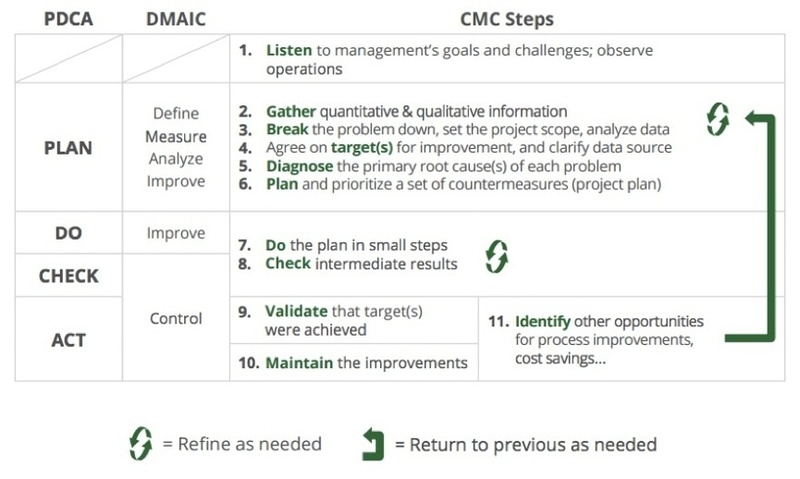 Below you can see the steps, which are based on PDCA and DMAIC, that normally make up an engagement between CMC and a client. Hit the button below and fill in the form to watch the video where our President, Renaud Anjoran, talks you through the 11 step process improvement framework above which has been tried-and-tested by CMC's expert factory-improvement consultants, and also download your free copy of it as a PDF to use a guide for your own improvement initiatives.